These days the high cost of funerals has forced people to seek an alternative to burial. Some people are requesting cremation in their will and many are opting for cremation when their loved one passes on. Memorializing a loved one is very important as it allows you to keep a memory of your loved one close to you. Our line of wood cremation urns is quite stunning and the tones and grains of the wood leave a warm and inviting impression. 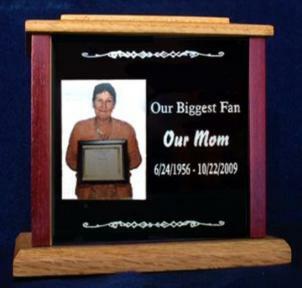 All of our wood individual urns are further personalized with a brass, silver, or black plate. Each urn has been sealed with several coats of clear finish. Losing a loved one is difficult, and having their urn nearby will be a source of comfort to you in the early days after their death and provide you with fond memories in the future. Our urns are handmade using exotic woods, the top, bottom and side panels are real solid wood, not veneer, simple pine, or economical MDF. The exotic woods include eucalyptus, purple heart and walnut. The sides are made from the exotic or hard woods and the top and bottom are made from oak. No stain is used, it is only the natural wood color and a clear finish. They are engraved to your order, with a photo of your loved one and a brief sentiment. Our urns have a capacity up to 225 cubic inches: 225 cubic inches for a loved one who weighs 225 lbs or less. 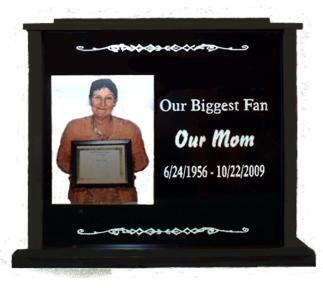 **Note: If you need a larger size urn, please contact us, we can make one larger if needed. Side panel wood choices shown below. The pine urn is all pine, top, sides, and bottom. Exotic wood urns have oak tops and bottoms. The front and back panels are either maple or cherry plywood for stability. Solid black urn at the top of the page is made of economical MDF and painted with an eggshell finish, with a full anodized gloss black finish over aluminum plate, so when lasered the text shows silver. Fill out the form below to order. The top part of the form is the purchaser information. Green sections are info to go on the urn itself. Please fill out the form and submit before using the add to cart button as this will take you to the shopping cart. 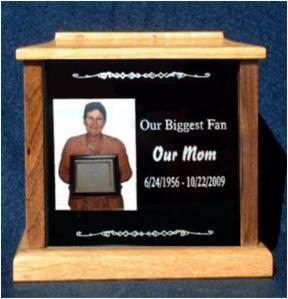 Then email us a photo of your loved one, (the lighter the background the better) that we can put on the front plate of the urn.